Many visitors will think that our site was a former Midland Red bus garage. In fact it was previously the base for RAF Wythall. 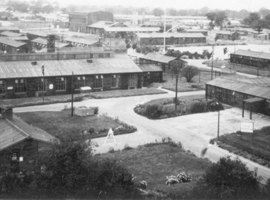 In 1939, RAF Wythall was opened as the Headquarters of No.6 Barrage Balloon Centre with responsibility for the balloon defence of the southern part of Birmingham and Coventry. The territory eventually covered about 600 square miles and employed both RAF and WAAF personnel. At least one of RAF Wythall's barrage balloons did actually disable an enemy aircraft. On Wednesday 9 April 1941, a Heinkel He111P bomber flown from an airfield in Northern France hit a balloon cable and part of its wing fell off onto houses in Balden Road, Harborne; it was shot down by a Boulton Paul Defiant and crashed in Hales Lane, Warley. Following the end of hostilities, the station became No.105 Personnel Despatch Centre (WAAF) Wythall, handling the release of servicewomen from all types of air force work. Upon closure of the demobilisation centre, RAF Wythall became the Headquarters of No.1 School Of Administrative Trades, essentially a training centre for air force clerks. 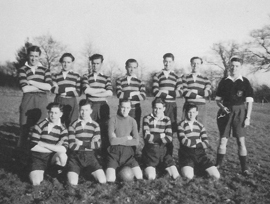 RAF Wythall's significant activity between 1952 and 1957 was being part of the Joint Services School For Linguists, which catered for all three services by teaching servicemen Russian, Chinese, Polish, Czech, and German, for them to become interpreters and translators. RAF Wythall finally closed operationally in December 1959. During the next few years of "care and maintenance" it became well known for its beautifully kept gardens and greenways. 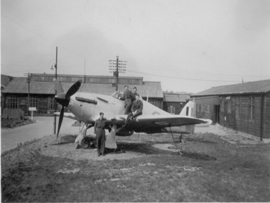 The Transport Museum would be pleased to hear from anyone with memories of RAF Wythall. Likewise, the RAF Linguists Association would be pleased to hear from anyone with memories of the base during its JSSL era.